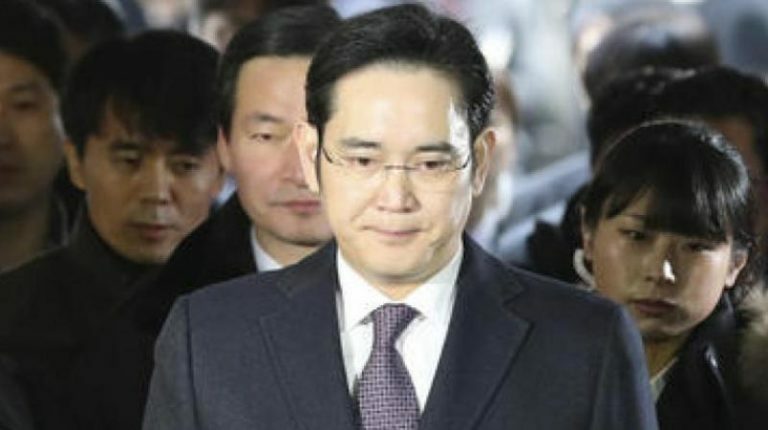 A court on Friday sentenced the billionaire head of South Korea’s Samsung Group, Jay Lee, to five years in prison for bribery. After a six-month trial over a scandal that brought down the then president, Park Geun-hye, a court ruled that Lee had paid bribes in anticipation of favours from Park. The court also found Lee guilty of hiding assets abroad, embezzlement and perjury. Lee, the 49-year-old heir to one of the world’s biggest corporate empires, has been held since February on charges that he bribed Park to help secure control of a conglomerate that owns Samsung Electronics,. Lee, who re-emerged stony-faced from the courtroom in a dark suit, but without a tie, and holding a document envelope, was escorted by justice ministry officials back to his detention center. “This case is a matter of Lee Jae-yong and Samsung Group executives, who had been steadily preparing for Lee’s succession … bribing the president,” Seoul Central District Court Judge Kim Jin-dong said, using Lee’s Korean name. Kim said that as the group’s heir apparent, Lee “stood to benefit the most” from any political favors for Samsung. Lee denied wrongdoing, and one of his lawyers, Song Wu-cheol, said he would appeal. The five year-sentence, one of the longest given to a South Korean business leader, is a landmark for South Korea, where the family-run conglomerates, known as chaebols, have long been revered for helping transform the once war-ravaged country into a global economic powerhouse. They have more recently been criticized for holding back the economy and stifling small businesses and start-ups. Samsung, a symbol of the country’s rise from poverty following the 1950 to 1953 Korean War, has come to epitomize the cosy and sometimes corrupt ties between politicians and the chaebols. “The ruling is a turning point for chaebols,” said Chang Sea-jin, a business professor at Korea Advanced Institute of Science and Technology. “In the past, chaebols weren’t afraid of laws because they were lenient. Under South Korean law, sentences of more than three years can not be suspended. The third-generation de facto head of the powerful Samsung Group, Lee has effectively directed operations since his father, Lee Kun-hee, was incapacitated by a heart attack in 2014. Some investors worry a prolonged leadership vacuum, with no one to make big decisions, could slow decision-making at the group, which has more than five dozen affiliate companies and assets of 363.2 trillion won (322.13 billion dollars). Its listed companies make up about 30 per cent of the market value of South Korea’s KOSPI stock index. Many tycoons, including Lee’s father, were convicted of crimes in the past, ranging from bribery, embezzlement and tax evasion, only to get presidential pardons, as both the government and the public feared going too hard on them would hurt the economy. South Korea’s new liberal president, Moon Jae-in, who won a May election, has pledged to rein in the chaebols, empower minority shareholders and end the practice of pardoning tycoons convicted of white-collar crime.